The ORC is a twice-a-year blogging event that challenges participants to completely redesign a space in 5 weeks. 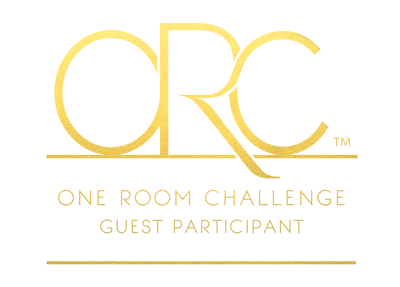 I am not a designer, but a lot of DIY bloggers join the ORC as guest participants. And since we just bought our first home and I’ve been hard at work making it our own, I thought it was a great time to join! As I said in my week 1 post, I didn’t want to take on a major project for my first One Room Challenge room. I’m worked on a space off the side of our kitchen that we use for our dining area and my office space. WEEK 6: DONE: And here it is! It turned out just amazing! The black statement wall is awesome. So bold. You go girl! Thanks lady! I love it too <3 And your powder room is gorgeous!! Everything came out amazing, Brittany! I loved every detail from that dark accent wall to all the plants in this space. Congrats on a beautiful transformation! It’s been fun following along everyone’s progress these 6 weeks! Thank you Tee! I have been dreaming of that black wall for a while now. I’m so happy I finally have it! Absolutely beautiful! SO many fun little details! Oh my life this is gorgeous!! I love that black wall! oh brittany, this is incredible!!! LOVE LOVE LOVE! what a great space to work in! This turned out so good! I love how clean and modern it looks and love that dark moody wall! Absolutely stunning! 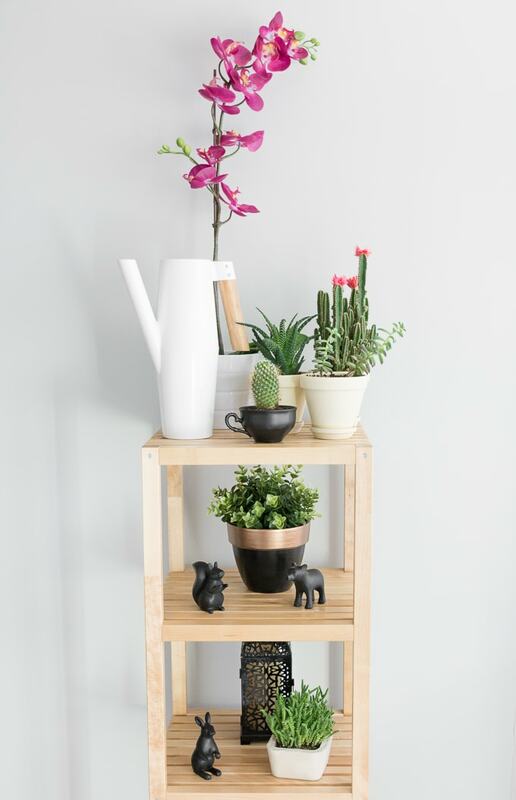 I love all of the plants – I never have enough plants in my house and you’re inspiring me to get some more! I also can’t get over that black wall. So, so gorgeous!! I’ve been so excited to see this reveal and you did not disappoint! I love all of the bold colors against the white! The gold accents are everything! Great job! In love with that dark wall!! 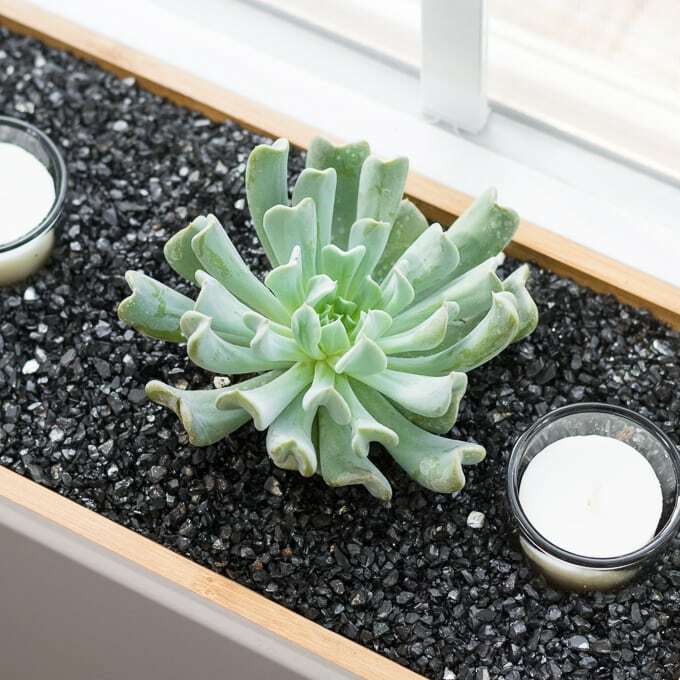 All the little details too are super cute and really pop in the space! It’s so pretty! I loved how it all came together and how everything pops off the black wall. Good job! 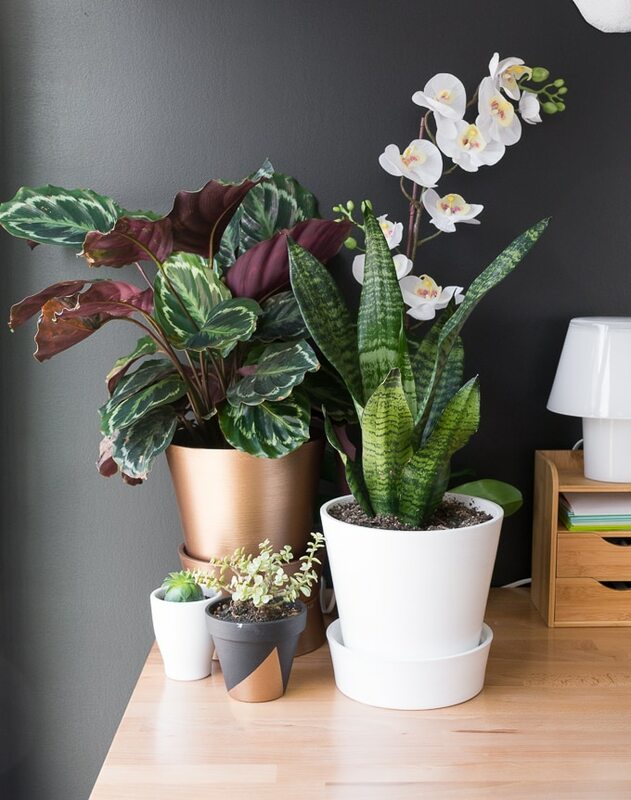 Love your plant-filled room and that dramatic black wall, You have some pretty dramatic models too! Yes, I’m thinking about decorating them for Christmas already… Thank you!! So So chic! That first photo is a knock-out! 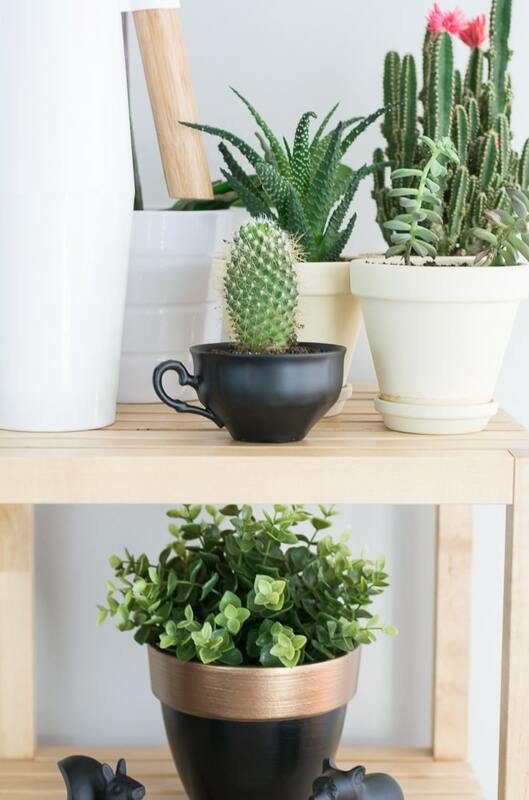 The different colours and textures in the plants and pots are such an interesting visual component of the space, and everything looks so sharp against the white and black. Well done girl! Hey lady! Thank you so much!! Brittany! This whole space is stunning! I’m so in love with the black, white, gold, and wood combo. Amazing! 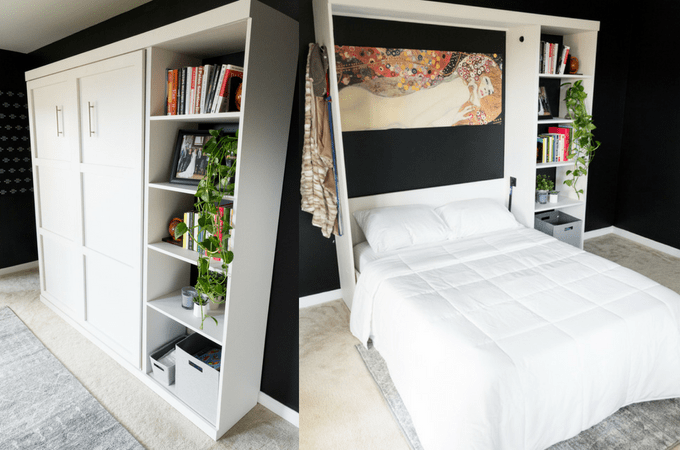 Come re-do my closet like yours and I’ll come re-do your workspace like mine! Deal? This space is SO gorgeous!!! I love the wall colors… everything just pops against them. Love. Love. Love. I love the black shade and the black wall so much! It turned out amazing. 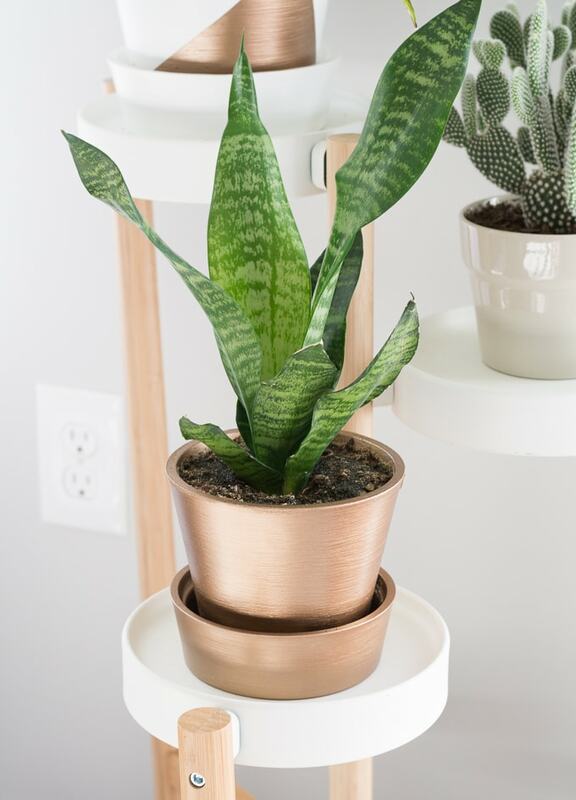 Love all the plants! Thank you! 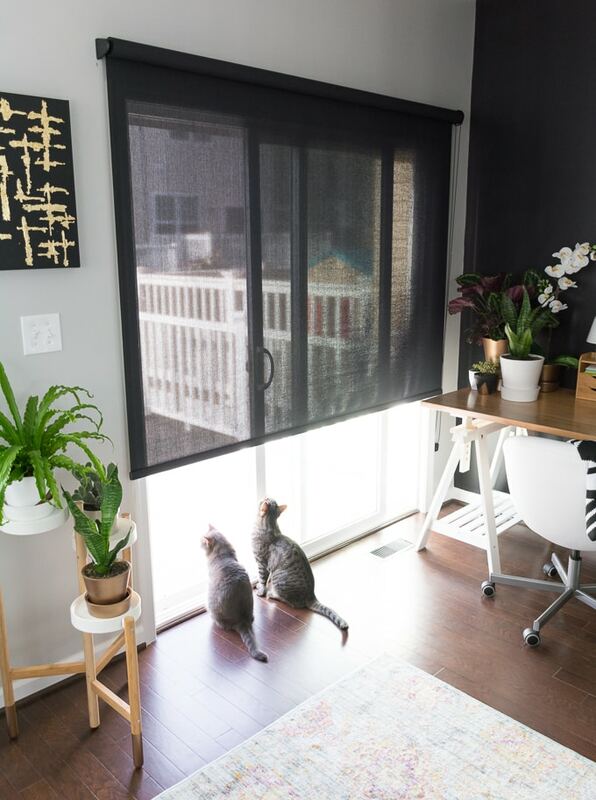 And the black shade is from Home Depot…it was 1/4 the cost of the shade I was considering from Next Day Blinds! Lovely! The desk area is awesome! Great job! Aww, kitties! But in all seriousness, gorgeous space. Love the moody dark wall and accents. 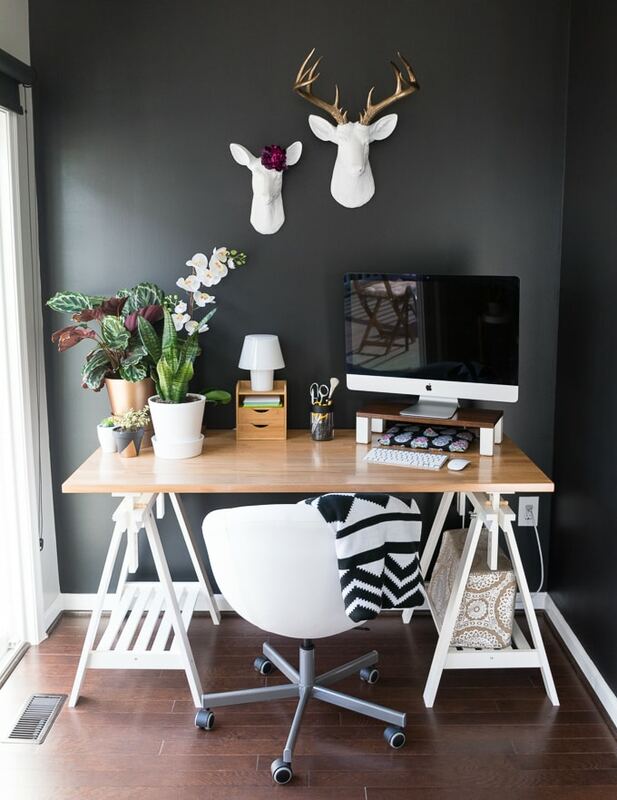 I love the contrast in colors and the Faux deer are Fabulous! Very Modern and smart Design! I love it! 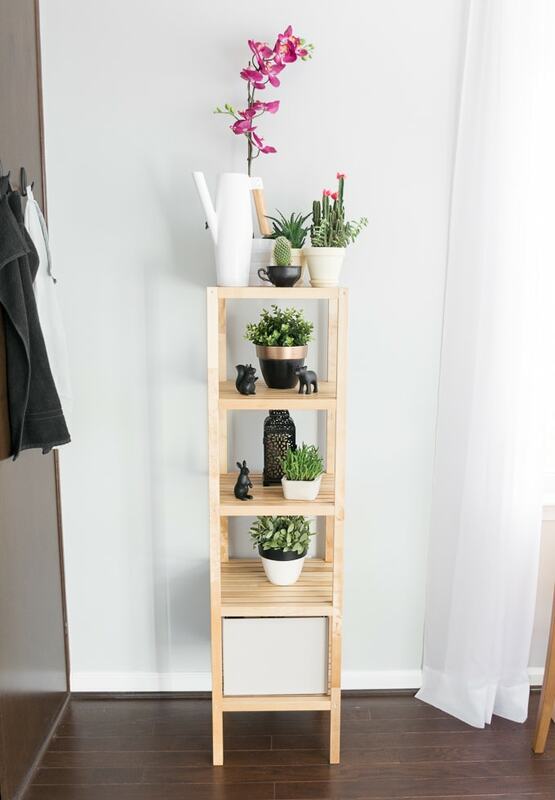 I’m a sucker for all of Ikea’s pine furnishings too! They’re so fresh and bright and great contrast with the black. This is my kind of space! Congrats! Thanks Karisa! We may or may not have another pine furnishing coming in to the living room…they are great! Oh-MY Goodness, the contrast of colors are beautiful, love the plants against the dark walls. That cat is gorgeous. I have 4 cats! oh my i love it!! The golds, pops of green from all the natural elements, and that bold dark wall…LOVE IT! 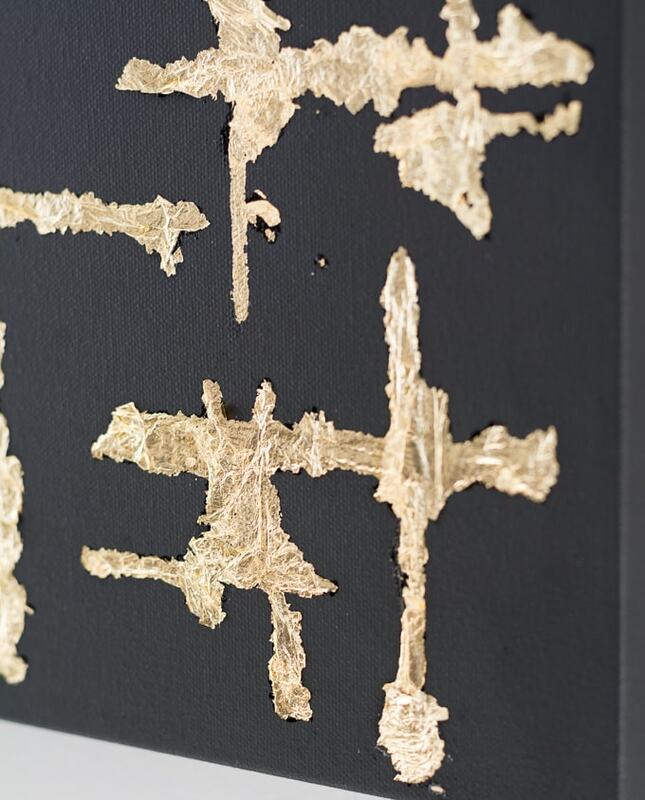 The gold leaf art is still my fave..i’m so going to try that! Thanks Colette! I love your living room, too!! Love that you turned the space into something that works for you. 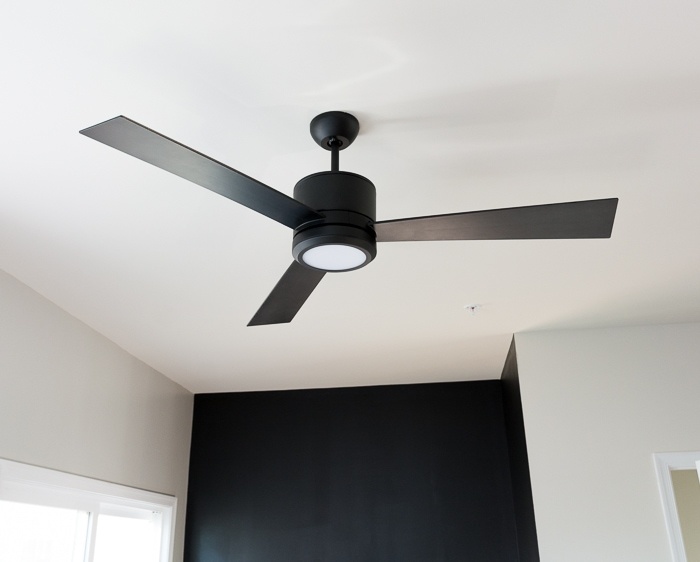 The ceiling fan & black wall combo is perfect! I love how this turned out! So pretty, and I have some major plant envy! Great work! 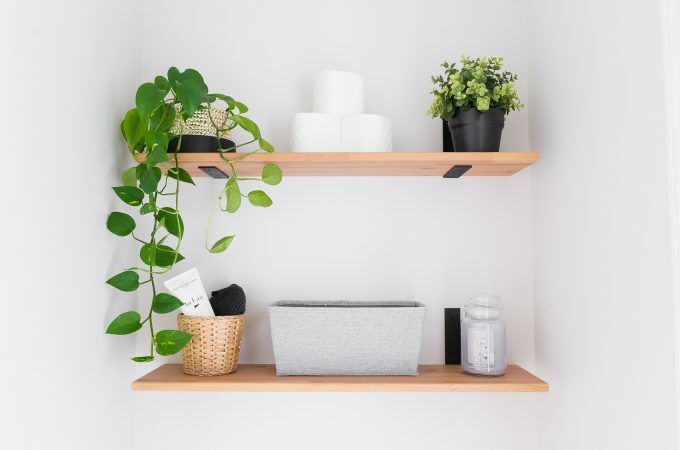 This space is beautiful – so functional and relaxing! 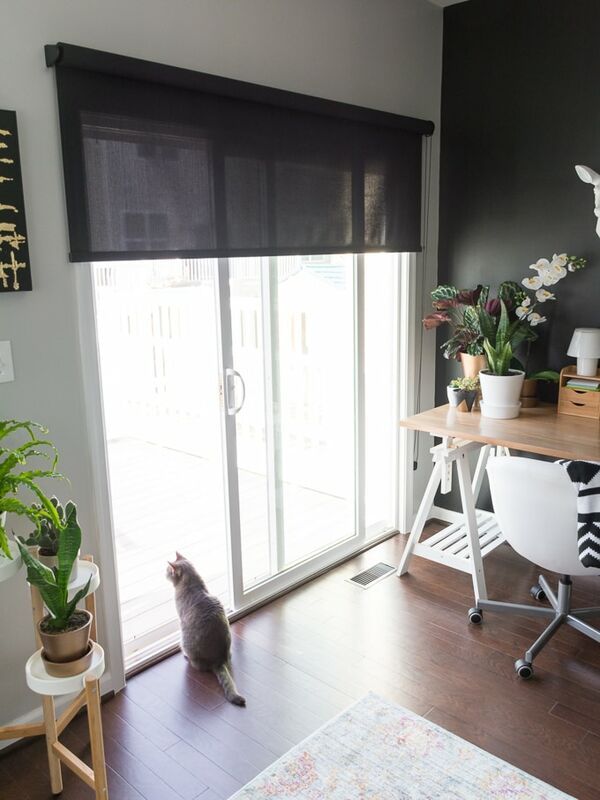 I LOVE all the plants and greenery you incorporated (you’ll be breathing clean air while you work, right?!) and your canvas artwork is just stunning. Job well done! Gorgeous! Great job! 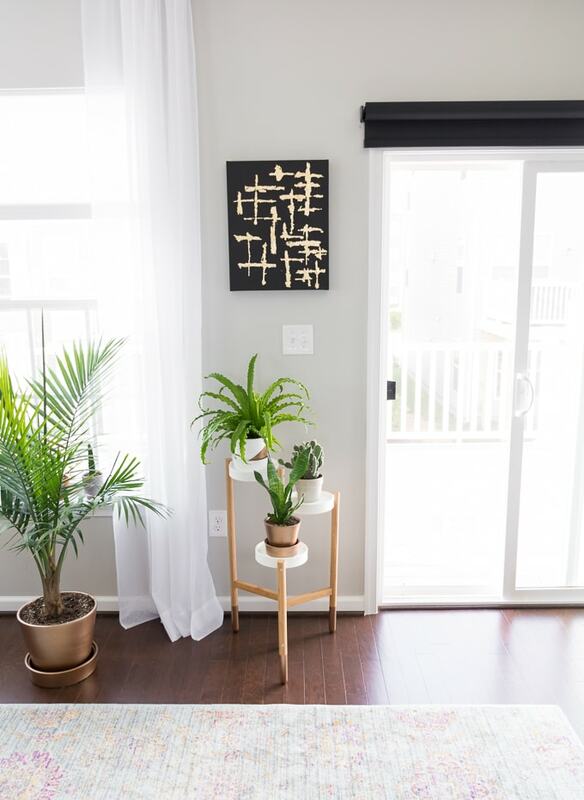 The black, gold, and wood tones all look AMAZING together! Yes yes yes!! This is a gorgeous reveal! 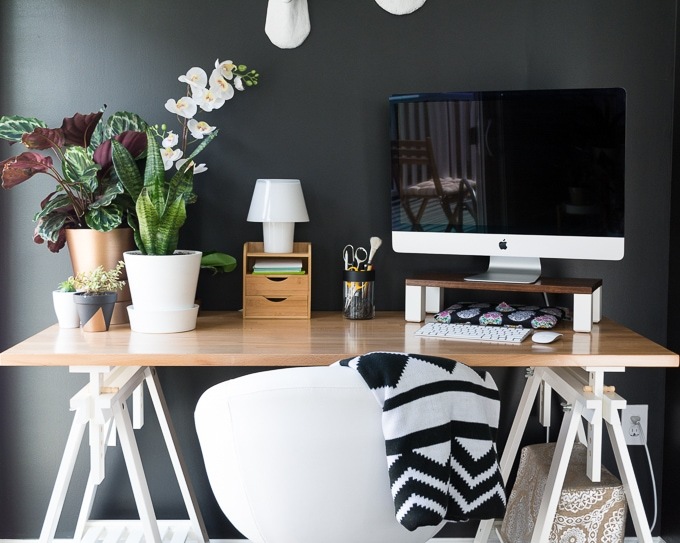 I am loving that office nook – that statement wall is the bomb! 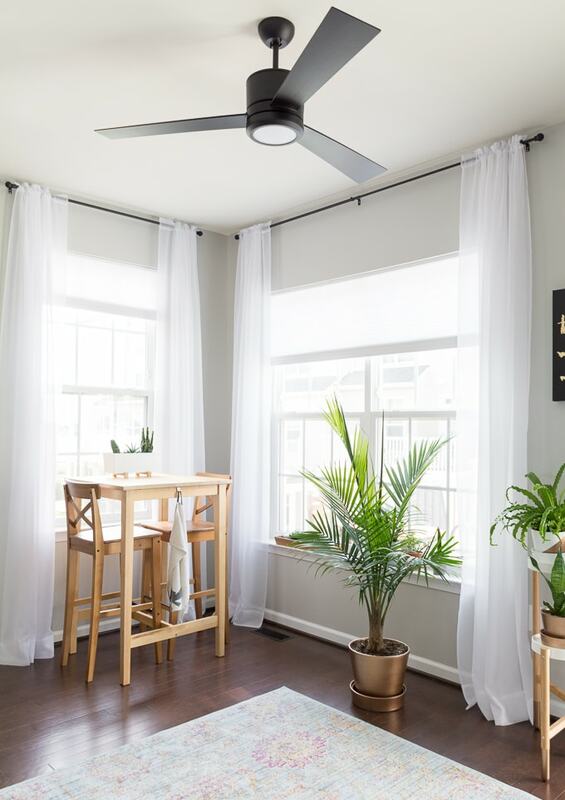 You did an amazing job on this room – congrats! 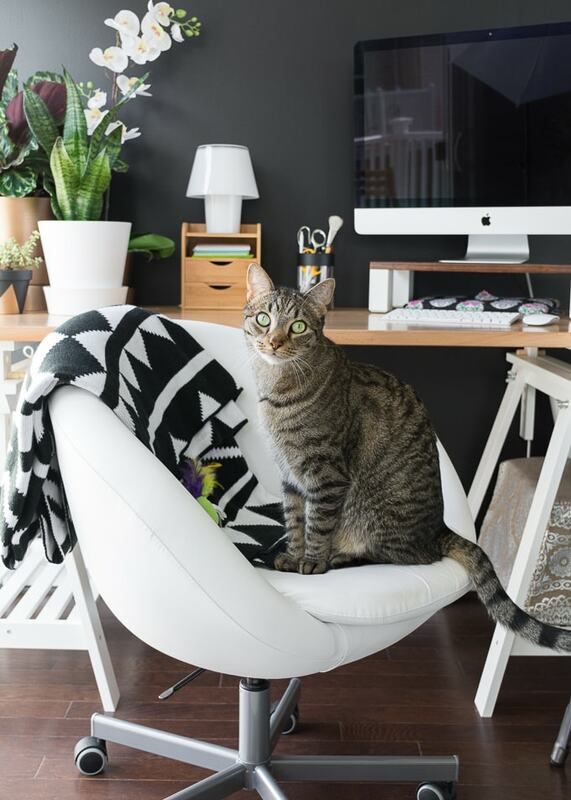 What a perfect office nook! And the black and gold artwork is so pretty! WOW!! Can we just talk about that black wall for a minute?!! LOOOVE! 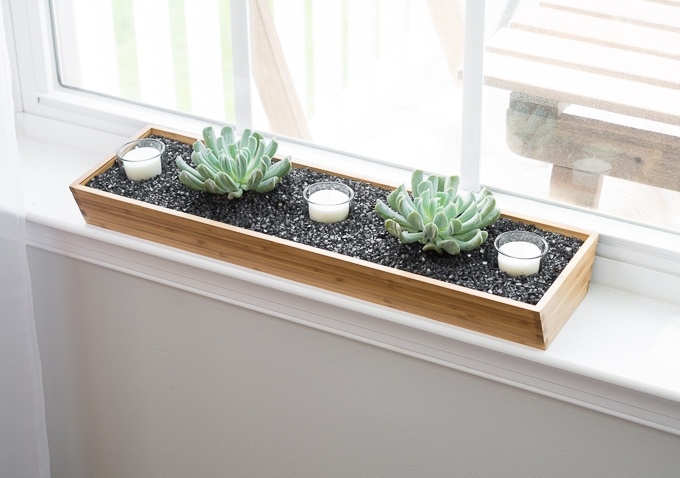 Your rug, plants [plus awesome planters!] and that gold foil art piece are all GORGEOUS! Beautiful job, Brittany!! Great use of that space! 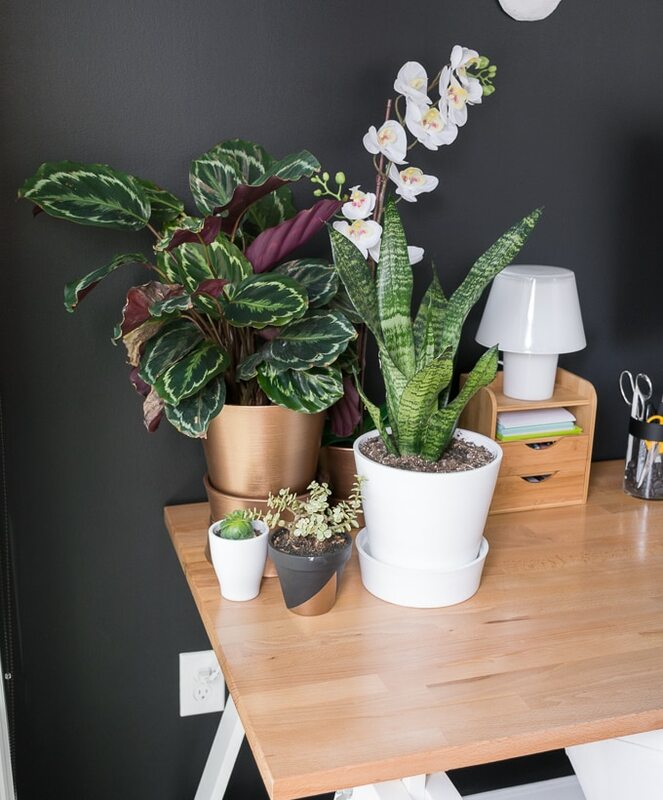 Love all of the plants and the black wall! I love how everything turned out and the dark wall is awesome. You have all the perfect details to make this area a hit! Yay for black walls! I love it! 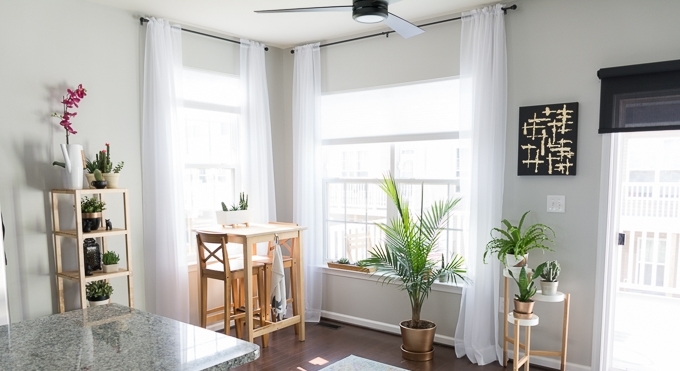 I love all the greenery you used throughout the room. 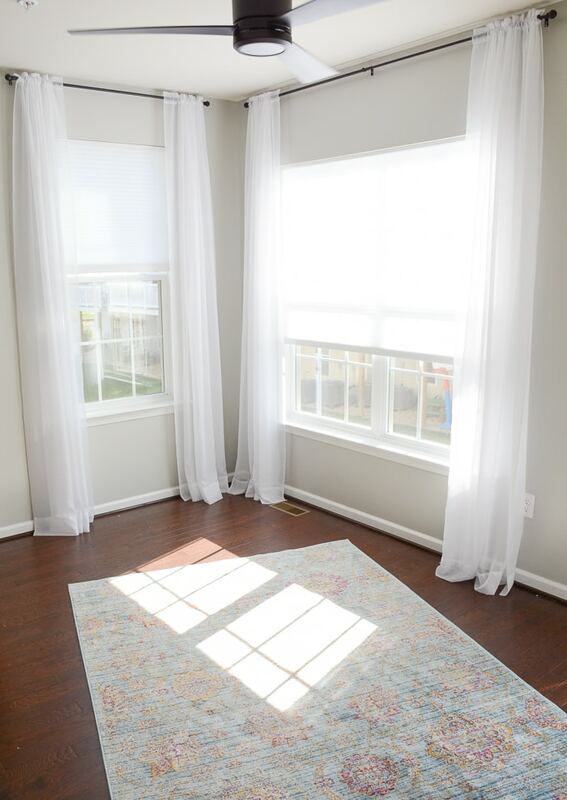 And that rug is gorgeous! Congrats on an amazing first ORC! 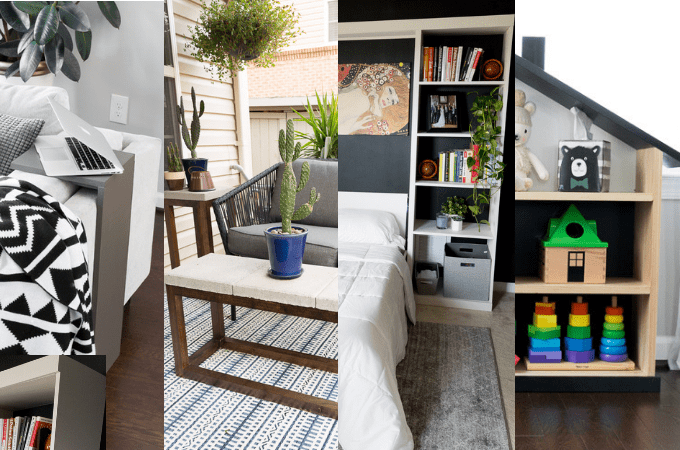 I am glad Jenny did this blog hop, so we can come back and appreciate so much more of everyone’s room, its worth the time and effort… You have transformed this space into pure style and class. 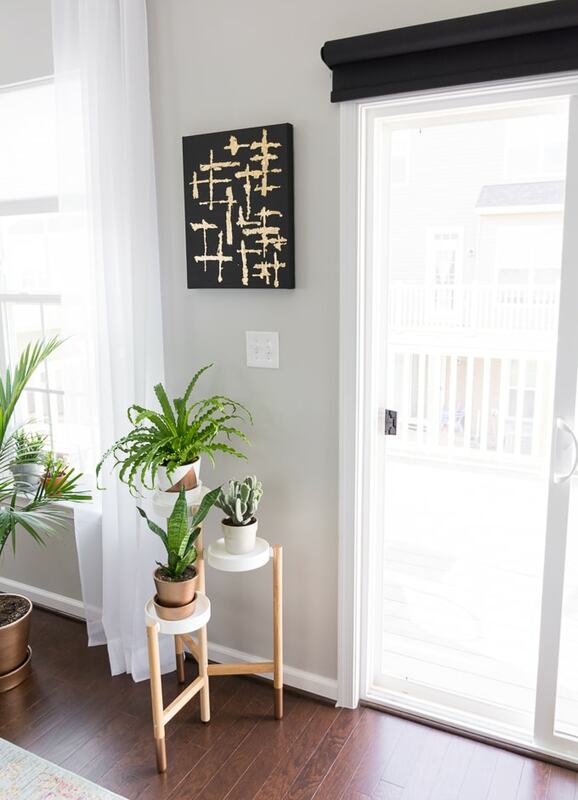 I’m loving your light and bright plant filled space Brittany! 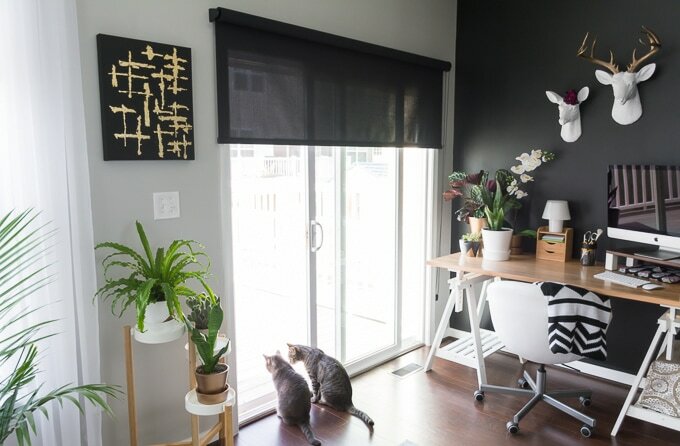 The dark accent wall looks sooo good, and the fun touches throughout! Wonderful makeover! Wow, what a great little space! I LOOOOVE that dark wall as a backdrop to all of the lighter pieces. You’ll get so much function out of that little corner now. Great job! Love this, Brittany! 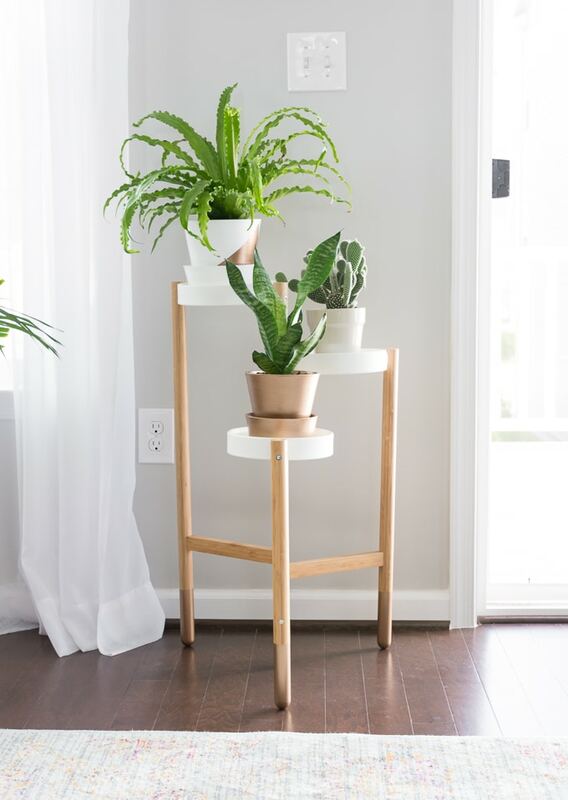 Great use of space, and I love all those plants. 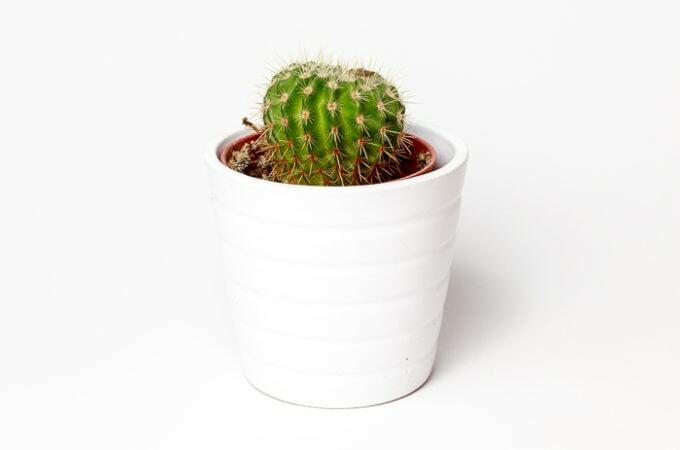 I wish I could keep a plant alive! LOL.